All Writing & Content © Nick Kushner Unless Noted Otherwise. 2002 AD. A, relatively, old essay / discourse of mine after delving into the occult for a couple of years. Written in the last quarter of 2002 in a literature college course I hated but attempted to make the best of. In a sense it set the tone for what would become The NACHTKABARETT a little less than 2 years later. To my knowledge, now as well as then, this is an approach and parallelism to Nietzsche's philosophy which has not been touched upon. BY A SINGLE ACT OF CREATIVE ADAPTATION. As given by Hermes Trismegistus, Lord of Wisdom, unto Maria Prophetissa, sister of Moses. It can be said that the man who hates religion the most is often the most spiritual of individuals in that he is living of his own convictions since he is the one who is not satisfied with the limits society has set upon him. Similarly he who is living by his own convictions is oftentimes one who is more prone to analyze nature and more importantly his own self. A key example of an individual as such would undoubtedly be Friedrich Nietzsche. He is a man who arguably coined the phrase "God is Dead" and wrote such books as The Antichrist. Nietzsche was a reactionary atheist yet an atheist who took to himself a new religion; he viewed man as something that "should be overcome." Many historians and propagandists have distorted this philosophy to meet their own schemes and as fodder for their own political motives yet Nietzsche's teachings bear striking parallels to another type of philosophical and spiritual approach, the modern Western occult. As such, when read metaphorically and symbolically it is apparent that there are many underlying occult significances and themes in the writings of Friedrich Nietzsche. Nietzsche's 1883-1885 "novel" of a philosophical thesis, Thus Spake Zarathustra, demonstrates the epitome of what his Übermensch is. Übermensch, which translates to Superman or Overman, is defined in Thus Spake Zarathustra and the methods and path to its attainment is outlined. The staple of this philosophy is "based on the force of the empowerment of the individual Will, or consciousness" (Flowers, 114). This power of the individual Will is a staple, if not the very root, of much of Nietzsche's work however for the sake of this author's argument the rubric will revolve around the definition and path outlined in Thus Spake Zarathustra. "God is dead", cried Nietzsche in the opening chapter of Thus Spake Zarathustra. This does not represent the destruction of the aspirant towards the greater good or the higher existence but to the contrary, the expiration of the ruling god of the complacent. The operative word when dealing with Nietzsche is "complacent" or "the herd" as he very often referred to the masses as being. If god is a shepherd, Nietzsche would advocate that the select enlightened few lay waste the pasture walls and fight in the wild free land so that they shall survive on their own by their own pride, abilities and willfulness, by their Will they shall succeed. It is a cry for a new era where we aren't slaves to a god that doesn't exist, an era where our independent Will will take us to greater heights rather than submission and forfeiture of that Will. "What is the great dragon which the spirit no longer wants to call lord or God? The great dragon is called 'Thou Shalt'. But the spirit of the lion says 'I Will!'" (Nietzsche, 55). 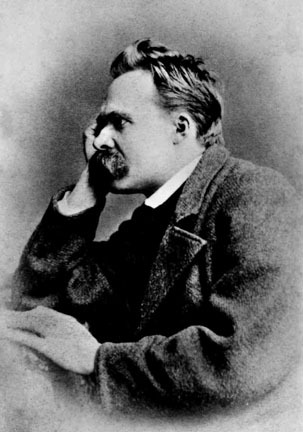 Instead of following God, as is the root of Christian spiritualism, Nietzsche illustrates that the differentiation between his philosophy and that of the "Great Dragon" of Christianity is that the attainment of the Übermensch is to become at one with God through the empowerment of the individual will instead of its submission in the name of the aspirant's spiritual goal. "I teach you the Superman. Man is something that should be overcome. What have you done to overcome him? All creatures hitherto have created something beyond themselves: and do you want to be the ebb of this great tide, and return to animals rather than to overcome man?" The crime we commit against ourselves, humanity and the preservation of the human intellect is that we don't aspire beyond ourselves. Undoubtedly bitter against Christianity for which he blames this ethos of submission over attainment, the Dead God Nietzsche proclaims is the death of our will to complacency and given way to the rise to our Will To Power. The irony that Nietzsche evidently didn't realize is that this treatise of the death of religion and the ascension of the Will is in actuality deeply spiritual, or at least in all probability he didn't plan on his philosophy having such deep-rooted spiritual connotations in the true sense of the word. For example, the closing of each chapter's "Thus Spake Zarathustra" is akin to a mass' "So Let It Be Done." This spirituality is absolutely divorced from the Christianity of the herd, it is a spirituality of the Qabalah, the staple of virtually all modern Western occult philosophies revolve around. Whereas Nietzsche spoke of a symbolic ascension of the soul or the Will the study and practice of Qabalah is that of a the actual ascension of the soul by mean of the Will. The study of Qabalah is one which has endured much longer than Christianity. It is not a religion per se nor a book of commandments but a way of thought and action, specifically thought and intent motivating action and the reaction that ensues. It is a process by means of which ascends the soul beyond our earthly state towards eventual unity with God, the highest plane of existence. "This state of total realization is obtained by balance and the raising of consciousness up through all levels of Existence to the source itself" (Halevi, Introduction). It is a goal that "only the man of deep devotion and conscious intention can sustain such a vision" (Halevi, 210). Akin to that of Nietzsche's Übermensch "these studies were considered highly secret; and yet, as with all esoteric doctrines, they remained concealed not because anyone hid them but because they were simply unintelligible to anyone who had no interest in the upper worlds" (Halevi, 17). The will of the individual must be ready and able to accept their own personal responsibility of their freedom and that they alone are responsible for the well being of the soul. "Yes, even when he commands himself: then also must he make amends for his commanding. He must become judge and avenger and victim of his own law" (Nietzsche, 137). The speculative Qabalah, which concerns the abstract philosophical doctrines on the nature of God, the universe and man; and the practical Qabalah which involves magical practices intended to produce specific results. The first seeks a transformation of the soul in accordance with the will of God, the second seeks a transformation in accordance with the will of man. Three Books Of Occult Philosophy, Henry Cornelius Agrippa. Trans. D. Tyson. Ed. Again, we see the idea of will and how it is integral to the process of transformation, both of the soul and man as well as an outline of a higher purpose of being. For Nietzsche, it is the Superman, "Man is a rope, fastened between animal and Superman, a rope over an abyss. A dangerous going-across, a dangerous wayfaring, a dangerous looking-back, a dangerous shuddering and staying still" (Nietzsche, 43). A spiritual voyage is echoed throughout these two passages, man being the voyager and the rope as the vessel just as society is the unforgiving and damning abyss below which one does not cross over readily as they curse your solitary feat. The Journey, "that is why it is sometimes called 'the Place of Dead', or where the sense of individuality may cease to be, because the Qabalist has passed beyond the fleshy estate" (Halevi, 214). Qabalistically this journey represents the ascension of the soul towards God, however, the Nietzschean equivocation of this journey represents man moving closer and closer to attaining the Übermensch. The further across the rope man travels the further distant and the further alien are those ideals and boundaries set forth for him in the state of Man. The further across the rope man voyages represents his greater independence and greater strengthening of his Will to do so, just as the soul's devotion, intent and ability is strengthens as it reaches the higher states. "Such spiritual excursions to the various stages of ascension were described in terms of Heavenly Halls, the Throne of God, and, in one work, a description of the Divine Adam and his dimension" (Halevi, 18). "The teaching is complete and perfect, although it wears many garments" (Halevi, 16). This is true in that in the grand, or Divine scheme, everything is related. One of these garments that the teaching may be disguised in is the pursuit of Alchemy. Almost as old as Qabablistic study, Alchemy is yet another esoteric pursuit which holds striking similarities to both Nietzsche and the Qabalah. Although the method of attainment has yet again been changed, the goal of the alchemist remains the same as that of the Qabalist "since the true alchemist was a special kind of person, probably too intellectual in many ways, who was seeking what he considered a higher goal than the facets of life". Alchemy is an occult study whose entire basis is also shaped around the theme of transformation. On a surface level, the transformations that are undergone are the transformations of metals and there are seven specific metals, each assigned a planetary likeness, which are dealt with in Alchemy, the Sun as gold, the Moon as silver, Mercury as quicksilver, Mars as iron, Venus as copper, Saturn as lead and Jupiter as tin. "Yet for the alchemist there was a fascination which led him on. The journey of exploration was not so much a chemical process as a search for the inner meaning of the whole material universe" (Burland, 1). Through the use of these metals the transformations of such occurs during their mixing. Mercury can be coagulated to slow its movement and any other can be made molten, in doing so to create an amalgamation that hardens and takes on new characteristics and properties. Early Alchemists, particularly when the practice of Alchemy was at its height in the Middle Ages, did not have modern scientific tools and methods nor did they have a modern set of elemental rules in dealing with the mixture and manipulations of such metals. Instead of formulas being used to illustrate change, paintings and etching with highly symbolic references were made to illustrate the metals and their changing properties. The dualities of nature such as the Sun and Moon were represented to illustrate this process as well as their combinations such as Mercury representing the hermaphrodite, the duality as one, unified as a whole was most significantly the most important of all Alchemical elements. To understand the mind and aspirations of the Alchemist we must also "think ourselves back to the position of the intelligent man viewing changes in things and changes in himself, and focusing his mind not so much on the details of the individual changes as on the idea of change" (Taylor, 7). The changes caused in Alchemical practice by the Alchemist were examples or allegories of the Great Work as to not think of a sublimation of Mercury as an individual act but part of the whole where this is one step in the elevation of one's soul to Übermensch. The wise old man with his crucibles and furnaces also had his learned books which served to guide him in his experiments. He was impressed with the need to develop his own personality until he was in touch with the whole of creation. The final revelation of the secret came with such suddenness. The alchemist firmly believed that a power from above had enlightened him at the moment when he was fit to receive the knowledge. The making of gold was thought of as a seal of approval set on a lifetime of work and study. A lifetime worth of study and process far exceeds the material value of gold unequivocally but it wasn't the material value that was sought after by the Alchemist, the day to day ritual of toil, sacrifice, study and transformations became his ritual, his furnace as his altar. Through his manipulations of the metals he is able to transform himself by proxy by taking on the role of the Creator to become as one, unified with God. For the alchemist his Great Work represented "man is a rope, fastened between animal and Superman, a rope over an abyss" (Nietzsche, 43). Teetering on the brink of madness the closer the alchemist achieves in creating gold the closer he is to becoming the Übermensch, being one and the same next to God where, "the seer has ascended the seven steps of wisdom. This could be explained by some modern mathematicians as a picture of ascent into muti-dimensional existence at stages rising beyond our three-dimensional world" (Burland, 25). The transcending of the laws of intellect which is madness in the ordinary man, genius in the Overman who hath arrived to strike off more fetters from our understanding. The savage who cannot conceive of the number six, the orthodox mathematician who cannot conceive of the fourth dimension, the philosopher who cannot conceive of the Absolute – all these are one; all must be impregnated with the Divine Essence [...] and give birth to their idea. 777 And Other Qabalistic Writings Of Aleister Crowley. Aleister Crowley. Thus the Übermensch is beyond man in all facets of comprehension and being as he has, as stated, transcended to a higher level than man as well as the beyond the comprehension of the ordinary man. As Crowley states further to illustrate the comprehension of the uninitiated and unenlightened, "The secrets of the Adepts are not to be revealed to men. When a man comes to me and asks for the Truth, I go away and practise teaching the Differential Calculus to a Bushman; and I answer the former only when I have succeeded in the latter" (Crowley, xii). Despite that Nietzsche would have considered one viewing his work as religion as a blasphemy, it is often that the individual who desires no followers is on the path to a higher existence. Although on a surface level Nietzsche's writings bear little similarity to any type of spiritual path it is our duty as intellectuals to view life metaphorically and symbolically and find the underlying hidden truth for ourselves as well as for the sake our selves. If there is a one true path to enlightenment the path will not be written in plain English, it will not be spelled out because it is not something that everyone deserves to know, it must be earned. It is one that must be lived first hand, and living life first hand by one's own firm convictions, not to follow the complacent herd is the philosophy of Nietzsche. If the process not be done that way then the process will fail as the adept must be able to comprehend and accept this higher existence else he be damned to repeat his life again. This is much akin to the concept of reincarnation and karma, as our soul is born unto lower levels of existence, such as an insect or a boar, if that life is lived to the fullest extent and knowledge of oneself and the world is able to be comprehended then each successive life will progress and ascend upwards into existences which are higher than the previous, assuming we earn that ascension by our practices and experiences. With that said it would not in the least be a stretch to equate Nietzsche's Übermensch with the obtainment of Nirvana. Just as Buddhism and Yoga can be argued for, the path to occult and spiritual enlightenment and attaining Übermensch are two different methods of attaining the same common goal. 1. Agrippa, Henry Cornelius. Three Books Of Occult Philosophy. Trans. D. Tyson. Ed. J. Freake. Llewellyn Publications: Minnesota, 1998. 2. Burland, C.A. The Arts Of The Alchemists. Weindenfeld and Nicholson: England, 1967. 3. Crowley, Aleister. 777 And Other Qabalistic Writings Of Aleister Crowley. Ed. I. Regardie. Samuel Weiser, Inc.: Maine, 2000. 4. Flowers, Stephen E. Lords Of The Left Hand Path. Runa-Raven Press: Texas, 1997. 5. Halevi, Z'ev Ben Shimon. The Way Of Kabbalah. Samuel Weiser, Inc.: Maine, 1976. 6. Nietzsche, Friedrich. Thus Spake Zarathustra. Trans. R.J. Hollingdale. Penguin Books: Maryland, 1972. 7. Taylor, F. Sherwood. The Alchemists. Arno Press: New York, 1974.